John Branston has posted a column on the City's budget woes, "A Primer on Budgeting," in which he says "a government budget has a lot in common with a personal budget or a household budget." So true. But I think he missed an important part of that analogy. Whenever anything is charged to the CIP budget, the City has to go out and sell bonds to get the money. The bonds eventually have to be paid off, but the blow is softened because we're not paying cash. You and I have figured out that credit cards can be dangerous. They make it all too easy for us to go out and buy things we think might give us an emotional gratification, but, truth be told, we don't really need. In the current economy, many households are trying to get control over their credit card debt. We're charging less, not more. Many of us paying down our credit cards. Some of us are tearing them up. But not the City of Memphis, it seems. With our handy CIP credit card, we're buying a new boat dock to nowhere, for riverboats that aren't even running any more. For tens of millions of dollars. Please email your City Council members. Action News 5: Beale Street blunder? "Two million dollars, frankly, is what we're looking for to keep this project going and not slow down any construction." While technically true, it may give you the mistaken impression that the shortfall is only $2 million. The whole truth is that RDC plans to come back at budget time in May and ask for an additional $7 million. Worse, if this $2 million allows them to restart the project, they can proceed with Phase III and possibly Phase IV, plowing tens of millions of dollars more into the project and making it far more difficult for Mayor Wharton to reconsider. Therefore, this $2 million might not seem like very much, but it's probably the last chance for Memphians to retake control over their own riverfront. Click here to read ten good reasons to vote against the funding -- putting a hold on the project until Mayor Wharton can give due consideration to all reasonable alternatives. I've written about one alternative at this link. Mayor Wharton’s transition report recently concluded that "the City of Memphis has long suffered from not having an overarching sense of strategy in its planning and goal-setting." That is perfectly evident on our riverfront, where the strategy now seems to be: "Keep on keepin' on." And, "We have to use that 'free' Federal dollar, even if it costs us another $3.68 -- to build a boat dock to nowhere." Good urban planning is usually represented by a strategic master plan, coupled with an ongoing process for adapting to changing realities. It's time to be honest with ourselves: We don't have a master plan for the riverfront. The $270 million, 2002 Riverfront Master Plan was gutted over four years ago, by removing 60% of it (the unworkable land bridge and lake). Without the guts, the rest made little sense. It was never redrawn. And the only project to come out of that plan? Beale Street Landing doesn't follow the plan at all. It merely keeps the name and location. But that's also the good news: Other cities that started grand waterfront projects now have mountains of debt, and are struggling to figure out how to finish their projects. We spared ourselves from having to learn the hard way. Let's take advantage of our good fortune. Let's learn some lessons from our experience. Let's be strategic again. But before we can do so, we have to stop digging ourselves deeper into the hole at the bottom of Beale Street. I ask that you freeze this project and gather the information necessary to make a long-term decision about its funding, maintenance, operation, and cost-effectiveness. A few days ago, a City Council member told me about their concern that, whatever we do, we should be guided by a master planning process. The member pointed out that other cities have created their riverfronts within the frameworks of multi-decade master plans. I am sympathetic to that point of view. We do not need to have that debate. Instead, what we all need to realize is very simple: Memphis does not have a Riverfront Master Plan. It died and was officially declared dead by the previous City Council, in January, 2006. That was when the City Council ratified the decision to remove the infamous land bridge and lake from the Master Plan. The land bridge itself accounted for about 60% of the development in the design. It wasn't just a feature and "signature" element — it was the guts of the plan. Without the land bridge, the rest of the RDC's development plan made little if any sense, save possibly for a privately-owned tract north of I-40. For example, the Master Plan would have bulldozed Mud Island River Park (leaving only the river model). As you undoubtedly know, however, MIRP still exists. For months the RDC has been holding a public process to guide the future improvement of that park. For all the projects RDC claims to have developed or started over the past ten years, only one was even suggested by the 2002 Master Plan: Beale Street Landing (BSL). And if you have been following this blog, I've made the case over and over that the BSL you know about today isn't the one in the Master Plan of 2002. It's radically different in its goals and design. Its remaining connection to the old plan is that it keeps the name and location. The Master Plan has been an embarrassment for the RDC. When they were asked to come before the City Council Parks Committee and present it, RDC officials brought only three copies along. They didn't show pictures of it in their PowerPoint. They spent the hour convincing City Council members that the (unseen) plan was only a "vision." This [BSL] project provides funding for the first major project in the implementation of the Riverfront Master Plan approved by the City Council in May of 2002. Why do they keep this pretense going, and why do others allow it to continue? Thank goodness the land bridge is gone. But the previous City Council should have in 2006 directed the RDC to lead a new process to come up with its replacement. Instead of redoing the Master Plan back in 2006, we took the cheap and easy route. By a one-sentence resolution, we "removed" the land bridge, and have since kept up the pretense that there still is a Master Plan. Master planning is great. A master plan is like the tracks that the big train needs to run on. But the fact of the matter is that this riverfront train went off its tracks years ago — and it is now running over all of us. What's it going to cost? An update. Note 1: $36.3M is the sum of the construction estimate ($35M, which was reported in the media) and the cost of design ($1.3M). Frankly, I don't know of any project that doesn't get designed before it's built, but the RDC prefers to show them separately. And when the newspapers pick up the $35M and miss the other $1.3M, I'm sure that the RDC is happy to leave well enough alone. $35M sounds smaller. But I prefer to have the whole truth: $36.3M. It's interesting, however, that the RDC calls all of this design cost "unanticipated." If that's the case, then can we assume that there are some more design costs that were anticipated, and these need to be added on top of $36.3M? As I said, any project I've ever heard of "anticipates" hiring some architects and engineers and getting a design. Or did the RDC think they would get a shovel-ready design from Argentina (on the cheap) and not have to do any more work to complete it? So I strongly suspect that either there are more design costs not included on this page. Otherwise, I'd have to conclude that the folks at the RDC are rather foolish. Speaking of Argentina: On another page of their PowerPoint, the RDC reports spending $126 thousand on an International Design Competition. Maybe I should include this too, but it's not very significant. Note 2: To get total sunk costs through Phase II, I had to add in those pesky "unanticipated" design costs again. With Phases I and II, it comes to $8M, or about 22% of the total project cost. But here's the odd part: In May, the RDC told the City Council it had already sunk $11M into the project, and that was before the RDC had even received all the bids for Phase III. What's going on? Are there some costs they were including then, but are neglecting to include on this page now? Once again, I suspect we don't have the whole story. There may be some more costs out there, perhaps as much as $2 million. 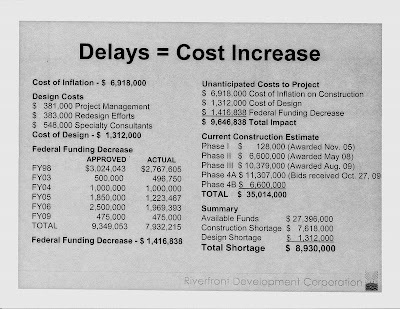 Possibly these would be design costs that the RDC conveniently omitted mention of because they don't help explain the point of the PowerPoint presentation: Why they are $8.9 million short and 3 years late with the project. Note 3: I've simply added the bid price for Phase III ($10.4M) to the previous Phase II sunk costs total ($8M) to get $18.4M. Phase III is the steelwork - the floating docks and the helical ramp. The public won't get to see this work-in-progress; the steel dock will be built somewhere else and then barged in. At the conclusion of Phase III, the City would have sunk $18.4M into the project, and we'd then be over 50% invested. Thinking out loud: If I were trying to save my project, I'd want to get this Phase III done, pronto, in hopes that nobody would have the stomach to stop the project once it's half done! A couple of weeks ago, someone requested a search of the City records. There is an entry for the winning bidder on Phase III -- but no contract could be found. This is why I am calling for a project freeze and an independent audit. I said previously that Memphis Magazine (February issue) has blockbuster article about the riverfront that should be read by everyone, but that I do have a couple bones to pick. 4. Friends for Our Riverfront must compromise on the Promenade." It's based on a mistaken premise that is, unfortunately, widely believed: That the Overton descendants actually have the legal standing to negotiate a compromise. They only have the standing to block an illegal misuse of the Public Promenade easement, which they did 50 years ago, and were sustained by a Tennessee Supreme Court decision. They don't have the power to rewrite the easement, whether they want to or not. "The matter of ... the Overton heirs ... I don't know when that will ever be resolved satisfactorily, in terms of some of the real estate that the Riverfront Development is looking forward to for public purposes. That still remains an issue which we're still no closer to." The truth is that the city hasn't held any meaningful negotiations with the descendants of the Proprietors (Memphis founders) in at least six years -- if ever. Why? First, the city's lawyers have long known that the descendants don't have the power to agree to a modification of the terms of the Public Promenade easement. Second, the city doesn't even want a modified easement. It wants to own the land outright, so it can lease or sell it to developers. The city paid thousands of dollars to a powerful Washington law firm to research how to accomplish this goal. By May 2003, city lawyers had concluded that the way to do it was by eminent domain. In other words: They want to condemn the Public Promenade and eliminate the easement. Why does Herenton (helped by this newspaper -- see "Time to move on the Promenade," Aug. 17, 2008) continue to perpetuate the myth that "Overton heirs" are obstacles to progress? Because taking property by eminent domain could inspire a public backlash. The myth is part of a deliberate public relations strategy to demonize the "Overton heirs" -- the Promenade's supposed owners -- so that when the city goes to court to condemn the Promenade, the public has little or no sympathy for the heirs' loss. The city will claim, of course, that when the heirs wouldn't cooperate, officials had no choice but to take it by eminent domain. But the descendants' "ownership" is the biggest fib. It's a legal technicality. As long as the property is subject to the easement, the descendants own nothing of any real value. The value is in the right to use the Promenade, which already belongs to the general public. What Herenton hopes citizens never realize is that the city would be taking their property by eminent domain so it can sell, lease or even give the land to private commercial interests. There is no practical way to modify the easement to allow the City to only partially misuse the Promenade -- just as there is no way to be just "partly pregnant" or "a little bit dead." The city's attorneys want to blow away the easement entirely, through eminent domain. But here's the problem. The bulk of the Promenade's value already belongs to the citizens of Memphis, for public use. The City would be using eminent domain to take that use and value away from the public and hand it over to commercial developers. After the national outcry over the Supreme Court's Kelo decision in 2006 (involving some private property owners), no city would want to invite the outrage that might result if the general public realized that the property was been taken from them. 2. perpetuating a myth that the land belongs to some "Overton heirs,"
4. so that the general public has no sympathy left when the City pulls the trigger. With all due respect, Branston's opinion innocently plays right into the City's hands, and helps shorten the time until the City pulls the trigger -- which they have long had the paperwork ready to do. If you do not believe I know what I'm talking about when I ascribe these nefarious motives to the City, then please read the minutes of the RDC's executive committee from back in 2003, obtained through Open Records request. Remarkable candor. It seems that the lawyers had far more input into the design than the public. But that was then and this is now. The RDC now claims it doesn't have an executive committee, so they don't have to expose their decision-making to the public and bloggers. Has the Promenade situation changed since 2003? No. When I wrote that letter to the CA just a year ago, Herenton was still avoiding the words eminent domain, and pretending that the "Overton heirs" were the obstacle to using the land for some "public purposes". The truth: He knew exactly how the problem could be solved and how commercial developers would get their hands on the Public Promenade for condos and hotels. As he spoke, the papers for the eminent domain lawsuit were sitting on City Attorney Jefferson's desk. I can assure you that the RDC hasn't forgotten the Promenade. Benny Lendermon has said so. Local developers have already drawn up pictures of what they'd like to develop on it. It's likely to be the next project after Beale Street Landing. Our community has only one front door and that is downtown. Our downtown has only one riverfront. The public promenade set aside by our founding fathers is the only publicly owned property on our city's high bluff that will ever exist. We must not let short term pressures override the long term best interest of our community. Meanwhile, the Public Promenade continues to be held hostage by the City, the RDC, and its Promenade Land Use Plan, so we can't do anything with it -- even if our ideas would be fully compatible with what the founding founders really wanted. I've been meaning to mention this: The February issue of Memphis Magazine has a blockbuster article, "Frozen" by John Branston, reviewing the history and the current situation with Memphis riverfront. If you don't subscribe, pick up a copy anywhere magazines are sold (Kroger, Walgreens to name two). It's loaded with scoop, insight and perspective. I could pick a bone with a couple of his suggestions (and will address them in future posts), but I'd recommend it everyone without reservation. Most cities have to wait until afterwards to read a good post-mortem of their big failures. We're luckier than most. We have John Branston and his publisher. Update: Incorrect Memphis Magazine link fixed.